What are some of the key GRC implementation related pressure points for your organization? 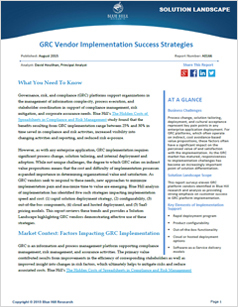 In the latest Blue Hill Research Report, “GRC Vendor Implementation Success Strategies”, process change, solution tailoring, deployment, and cultural acceptance are listed as key pain points. It also identifies key components of vendor responses to the challenge of implementation complexity.